It’s never a very comforting feeling when you walk into a room and see an insect dart under the bed or into a crack along the wall. What was it? Are there more of them? Should you worry? The first time you see an insect, don’t immediately panic. There are times when a cricket or other moth may accidentally make its way into your home and then never appear again. However, in the case of cockroaches, when you hear a lot of chirping, see multiple cockroaches at night or cockroaches in different parts of your home during the day, it means something must be done. Cockroaches are typically brown and can be over and inch in length. Living in West Palm Beach, the climate is warmer and they may grow larger. They have six legs, two long antennae, and though they do have wings they may not be particularly skilled at flying. Cockroaches head into homes when they realized it is a place with food, water, and shelter. They can get in through cracks on the outside of your home, vents, drain pipes, or even by hitching a ride on something we carry inside. Once they arrive, they are happy to find all the food and water, and will create a nest in order to breed. They also remain active throughout the year, which means if you believe you have a cockroach problem, don’t wait to act. If you aren’t sure and need to perform a quick test to see, go a location they may be hiding in, such as the bathroom, and turn the light off. Wait for about a half hour and then turn them on again. If you see them running for cover, it’s time to call a professional. 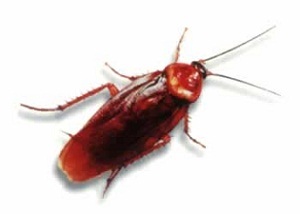 You can also look under your appliances or under other areas to see if there are any dead roaches. No one wants cockroaches in their home, especially because they can carry disease and their cast off skins can lead to worsening allergies for both adults and children. Contact Gulfstream Environmental if you live in West Palm Beach and get a free evaluation. We know precisely what to look for when it comes to cockroach infestations and can let you know what should be done if we do discover cockroaches in your home. Even better, you can feel at ease knowing we use environmentally responsible methods that pose no risk to you, your family, or your pets.